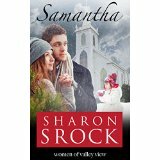 Samantha is the fourth book in the Women of Valley View Series. As with all of the books in the series, it can be read as a stand alone. However, the entire series is exceptional and you won’t want to stop until you’ve read them all. Due to circumstances far beyond her control, Samantha had to grow up fast. Being young and naïve, some of her past decisions have left permanent marks in her life; some good, some not so good. Going forward though, Samantha has given her life to God and wants to live a life worthy of Him. With the support of her family, Samantha is taking all of the steps necessary to create a good family life for her daughter, Bobbie. She has left her past behind with little thought to it until her past shows up on her front door with demands. She has no problem laying down the ground rules but an unexpected tragedy causes Samantha to ponder whether God uses punishment as consequences for sin. Patrick is in love with Samantha but she has made it clear that she won’t compromise her belief that they cannot be unequally yoked. Although Patrick has been taught about God, he has experienced too much heartbreak and doesn’t believe a loving God exists. But the God problem is keeping him from a life with Samantha. I think my favorite part of this story is how sweet four-year-old Bobbie has no qualms about her faith. She knows her angel is watching out for her and she has no problem sharing the news. Samantha is a great story that demonstrates being a Christian doesn’t exempt the believer from a life with real problems and sometimes horrible tragedies. It is being a Christian that allows the believer that extra source of strength to more than survive, to actually thrive. It is also a great reminder that forgiveness is not just for the offender but for the believer’s growth as well. I loved the book and all of the wonderful themes within it. I received this book from the author in exchange for my honest opinion which I’ve provided here.